I will check them. Do we have to start a whole new campaign, If we intend to play using mods or can we add them without collateral effects? Depends if the mods start to conflict. I am not that far. Actually, I just started the second mission. Maybe it's time to use some mods again. I think it's a fun addition that adds a bit more challenge to the game. I'm almost at the end I think, but I didn't have too much trouble. I may replay on legendary with a better ai mod. See how that goes. From all I've read, the mod "A Better AI" makes such a revamp on ADVENT's AI. 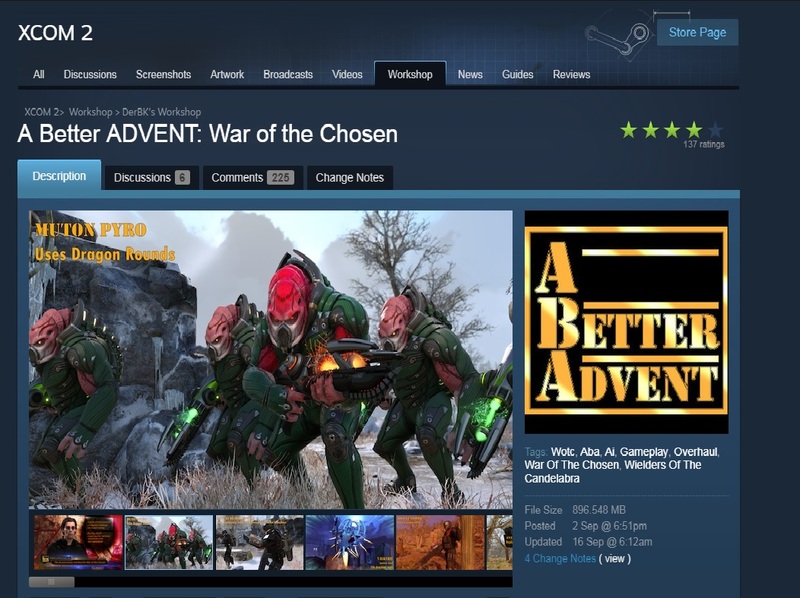 He also released "A Better ADVENT", which introduces new enemies with their own abilities, but if you use 'A Better ADVENT' you don't need to install 'A Better AI' as well, since it is already part of 'A Better ADVENT'. Last edited by henriquejr; September 16th, 2017 at 18:08. Game was much harder but also more diverse with it. I would not play on legend with a better advent mod. Not good enough for that. Oh I thought that was the old one. It wasn't there when I started. Not sure I'll have the strength to start over now with it, but probably would only play on Commander for that. Last edited by henriquejr; September 17th, 2017 at 01:55. Well, in the vanilla game, the start is the hardest. You get to a point, where all missions are relatively easy unless you make mistakes. For example, in my last mission, I was ambushed by an Archon Ruler(or whatever it is called), an Archon and a sectoid and I only lost one unit (an advent trooper) even though 4 of my units did not have cover and I forgot to use my frost grenades. You end up having so many options to use to help you out (e.g. 8 medkits, advanced teamwork,…) that it is more of a point of ending the game than actually challenging. So in essence, the "A Better Advent Mod" makes the game challenging throughout. That is one of the fun things about it. I have to do the last few missions as I've done the Blacksite, Codex and Stasis Suit missions. However, I now have 4 x 20% repeaters available, meaning every turn I'll be able to execute one enemy on average, so I doubt the last mission will be too difficult. Anyway, if you need any hints/tips, just let me know and I'm happy to help. It's based on a YTer (ChristopherOdd) who I watch sometimes. The game is a lot of fun like this, as it adds new mission types, new enemies, new SITREPs, a whole new faction, new classes, etc. Odd plays it on Legend Difficulty (HonestMan) with a 5-man starting squad and I tried that but got massacred, so I lowered the difficulty a bit to Commander and I am playing with a 6-man squad. Game is maybe a teeny bit too easy now, so I may try 6-player squad Legend (although I am not really in the mood to restart). I would certainly recommend it if you are in the mood for this type of game again. I assume all mods you're using work with WotC without issues, right? All that and no Minsc mod!? I have never been a fan of BG So no. Are you using a mod managing tool like Nexus Mod Manager or only the (not) good and old Steam Workshop, in order to have XCOM2 heavily modded like that?